Totally kidding, but we thought about it…for just a millisecond. Doesn’t he look ready to join the construction crew as he stretches out on this bearskin rug?! Hahahaha! Mark had no time to sleep on a bearskin rug as he spent this weekend and last weekend cleaning bricks. Like 1,500 of them. You saw in the last blog post that we had to tear down the front brick wall on our Victorian house. Our favorite “Tony G construction crew” also started tearing down the top floor of the second brick addition on the house. We’re eventually going to make that into a rooftop deck. We promise it will be awesome…I know it’s hard to see now. We wanted to keep the character of the house and reuse all the bricks, if possible, when putting the front brick wall back up. In order to use those old bricks, Mark had to brush all the old mortar off of them. A super tedious job, but an important one since our goal with this home is a Victorian RESTORATION! Because the front of the house is completely open to the elements, the crew wrapped it in a plastic tarp and put heaters in the house while they worked in the frigid weather. → The Fresh Prince of Lawrenceville! ← We Just Had A Baby…So Let’s Renovate Another House! Hi, Courtney, I enjoy reading your blog. Especially, seeing pictures of Hank and your new projects. Your friend, Suzie, has a great sense of humor. LOL. I’m sure your new Victorian house will be beautiful. You guys have great taste and insite. Will you guys live in the Victorian or sell/rent it? What have you done with the other restored houses? You ought to look into doing a reality show. 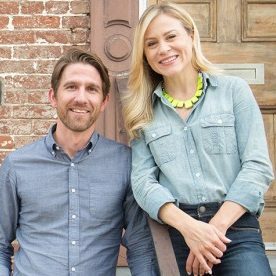 I just saw a new one on HGTV last week a brother and sister from Pittsburgh, called The Frank’s (something). Sorry can’t recall the full name. You guys would be great at that! Prayers for great health for You and your family.